Situated within easy access of the M3, this picturesque parkland golf course is the ideal test for skilled and beginners alike. 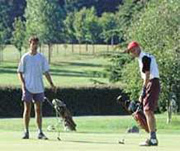 Open all year round the course can boast 18 very large greens, which are playable throughout the year. The clubhouse has all the requirements for any golfer. Comfortable showers and changing facilities compliment the relaxing lounge and bar which give fantastic views over the park. Space is available for private meetings, functions and events.